Stewart Falls is an incredible, thundering waterfall located within one of the best alpine wilderness areas that you can find in Utah. This hike really has everything….gorgeous views of a dramatic mountain range, lush forests of aspens shading the trail, and an amazing waterfall that you can play in. Not to mention it is also easily accessible and is a great family-friendly option. This hike is definitely not a secret! Many people enjoy this trail in the summer so you should expect to share the waterfall with other groups, especially on weekends. Even with its popularity, Stewart Falls is still certainly worth the trip. Plan some time to stop and take pictures of the canyon on your drive to the trailhead, especially if you are planning on driving the Alpine Loop that connects the American Fork and Provo Canyons. As we were getting into the car after our hike, I noticed several hikers that looked lost and weren’t exactly sure of which trail to take. A few different hikes leave from the parking area, so be sure to take the trail that starts near the bathroom. There is a fee deposit box near the backside of the bathroom, and the trail is right next to that. The next area of confusion for some people along the trail is how to get down to the falls once you reach them. As you come out of the trees and see Stewart Falls in front of you, there will be a large rock that people like to climb on to take pictures. To the left of the rock is the trail that will take you down to the base of the waterfall. Several other “trails” down to the falls exist, but the one described above is the easiest and safest way to reach the water. This trail is 3.5 miles round trip. From Salt Lake City, take I-15 South to Exit 272, which is 800 North in Orem. 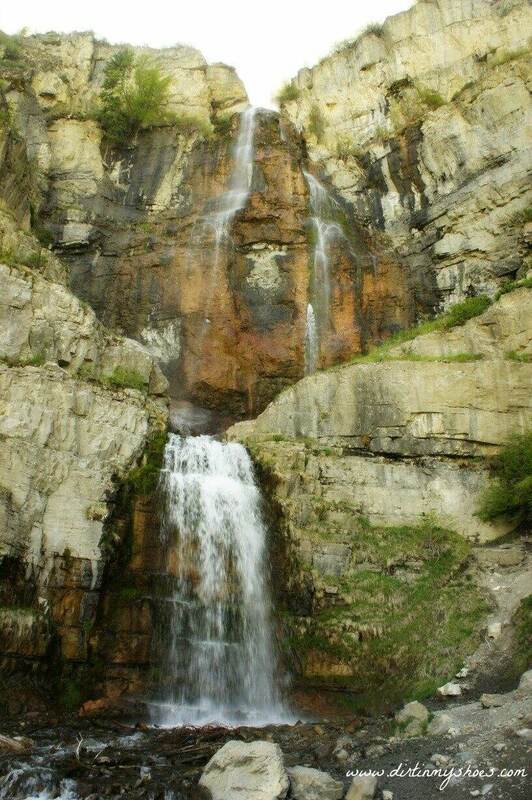 Head east for 3.5 miles until you reach the mouth of Provo Canyon, going left to enter the canyon. Continue up Provo Canyon for approximately 7 miles until you reach the turnoff for the Sundance Ski Resort. You want to be on the road that takes you to the ski resort. Travel this road for about 5 miles (past Sundance) and up the hill until you reach Aspen Grove. Drive past Aspen Grove, reach a fee area to enter the Alpine Loop, and the trailhead is just past the fee booth on your left. The fee to reach this trailhead and the rest of the Alpine Loop is $6 per car. Have you ever hiked to Stewart Falls? What was your favorite part?